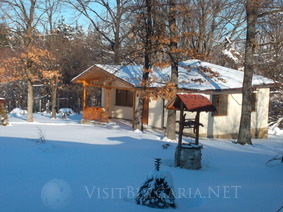 Location: "Mirage" Holiday Village is located in "Chukarite" villa area near Kotel architectural reserve in the heart of the East Balkan Mountains. Accomodation: It contains of five villas. Four of them offer 5 beds plus 2 extra beds in the sitting room. The fifth villa covers 45 square meters and is luxury furnished. It consists of a double room, a sitting room and a bathroom with jacuzzi. It also offers two extra beds in the sitting room. Hotel facilities: Within the framework of the complex there are a restaurant with a fireplace, a barbeque, a children play area and a waterwold on 6000 square meters.